December 10, 2018 10:58 am. All eyes were on Muntazah, runner-up in the 2018 Godolphin Mile (Group 2) on the Dubai World Cup card on his previous outing and one of the 15 runners in Sunday’s 1600m Sheikh Zayed bin Sultan Al Nahyan National Day Cup (Listed) for Thoroughbreds at the Abu Dhabi Equestrian Club. Saddled by Doug Watson for His Highness Sheikh Hamdan bin Rashid Al Maktoum, his trainer had warned he would improve for the outing with big targets awaiting at Meydan during the Dubai World Cup Carnival. Such appeared the case, as the well-fancied charge tracked the leading bunch throughout the first half of the race, only to drop away early in the straight under Dane O’Neill. Meanwhile, turning for home early leader Above N Beyond weakened, leaving Jaaref (also owned by Sheikh Hamdan) in front and he looked to have most of his 14 opponents beaten. However, in the predominantly yellow silks of His Highness Sheikh Ahmed bin Rashid Al Maktoum, Chris Hayes looked supremely confident on Forjatt, a 10-year-old and winner of this race in 2015. 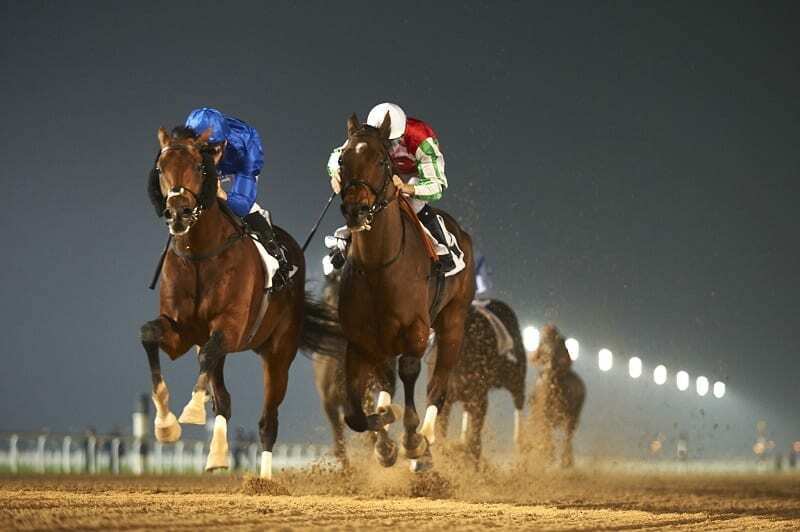 Weaving through runners throughout the straight, they hit the front 100m out to gain a popular victory for new Jebel Ali Stables trainer Nicholas Bachalard. Sheikh Ahmed’s Jaasoos was a dual winner of the National Day Cup, as was Emirates Gold, but both defended their crowns in consecutive years. Forjatt became the first horse to regain the title; all the more impressive being three years apart. Also over 1600m, the Purebred Arabian Sheikh Zayed bin Sultan Al Nahyan National Day Cup (PA Group 3) was won by RB Torch, originally the first reserve but granted a place in the 16-strong field after the defection of stable companion Abhaar, who was withdrawn after spiking a temperature over the weekend. Both, as well as two others—making for a quarter of the field—are trained by Eric Lemartinel for his main patron, His Highness Sheikh Khalifa bin Zayed Al Nahyan. Recording an eight career victory, fifth on turf and third over course and distance, RB Torch was having his third start of the campaign, having twice been well beaten. Bouncing back in emphatic style, he settled in midfield under Fabrice Veron, chasing down leading duo AF Mahshoum and AF Al Sajanjle at the 200m pole and going on to victory. “We broke reasonably, but then my horse took a little while to get into a rhythm,” Veron said. The opening 1400m maiden was contested by the maximum allowed field of 16, but very few were ever able to get involved and Pat Cosgrave, riding for Sheikh Khalifa and Lemartinel, was never headed aboard Eghel De Pine. They were pursued throughout by stable companion Highh Altitude, who plugged on gamely to hold on to second and supply the Al Asayl Stables team with a one-two finish. The 1400m handicap was decided in the very last strides when Connor Beasley produced Hawafez with a desperate late lunge, snaring Sam Hitchcott and AF Hakeem, who had only led themselves about 100m out. Trained by Ridha ben Attia—saddling his first winner of the season—for Salem Ali Murshed Al Marar, the 5-year-old Hawafez is now a winner twice after 20 starts; both over course and distance, having landed a maiden at this meeting 12 months ago. The 1600m maiden was a race trainer Saeed Al Shamsi will never forget after AF Shearr provided both himself and owner Khalid Salmeen Ali Theeban with their very first winners. Confidently ridden by Szczepan Mazur, who settled him just behind the leaders, he was produced to lead halfway up the straight and was always holding the challenge of runner-up Sallal Al Reef. Well-beaten on the dirt at Al Ain on debut just over two weeks ago, he was providing his jockey a second victory of the campaign. The concluding 1600m handicap produced a polished performance from Qader, confidently ridden by Adrie de Vries, who was never far off the pace before asking his mount to win the race inside the final 200m. The response was telling and they ran on strongly with the pair pulling clear in the closing stages. Trained by Jean de Roualle for Yas Horse Racing Management, 6-year-old Qader has now landed four of his ten UAE outings.